Plants have been manipulated by selection and breeding for millennia, to generate crop varieties with stable, engineered new morphologies. These domesticated plants form the bedrock of modern agriculture. Many of the genetic changes associated with crop domestication have been mapped precisely. Further, the genome sequences of up to 10,000 native plant species will become available over the next decade, as part of the Earth Biogenome Project. The domestication of crop plants like corn is associated with genetic changes of limited number and type - and are generally changes that trigger reconfiguration of regulatory networks. Humans have been selecting and cultivating genetically recoded plants for over 12,000 years. Ancient species are provided raw material for domestication of crop plants. Domestication has occurred over millennia, and often accompanied by substantial changes in phenotype. For example, melons were thought to have been originally used in prehistoric times as natural water carriers in northern Africa. The wild melons have a high water content but are bitter. The selection for sweeter tasting melons unintentionally produced pink flesh, as the genetic loci for colour and sweetness are closely positioned. In addition, bananas were first domesticated in Papua New Guinea. These were diploid and contained seeds. Modern bananas are triploid, sterile and seedless…and genetically homogeneous. Eggplants, or aubergine, have been grown in southern and eastern Asia since prehistory. A relative of the nightshade family, domestication has led to changes in size, colour, alkaloid content and loss of spines. Carrot was cultivated and used as a storage root similar to modern carrots in Central Asia beginning in the 10th century. The first domesticated carrot roots were purple and yellow, arriving in Western Europe and finally in England between the 11th and 15th centuries. Orange carrots were not well documented until the 15th and 16th centuries in Europe, indicating that orange carotenoid accumulation may have resulted from a secondary domestication event. In each of these cases, centuries or even millennia of domestication was required to produce the productive and more palatable crop plants that we recognise today. Crop plants sample a tiny fraction of total plant diversity. It estimated that there are around 400,000 plant species on Earth. Only around 20,000 of these have ever been used by humans as food, and only 2000 plant species have any economic importance as food crops. 30 species provide most of the world’s food. Three species - rice, wheat and maize, provide 60% of calories and over half of the protein in human food. A vast potential reservoir of biological diversity remains untapped. 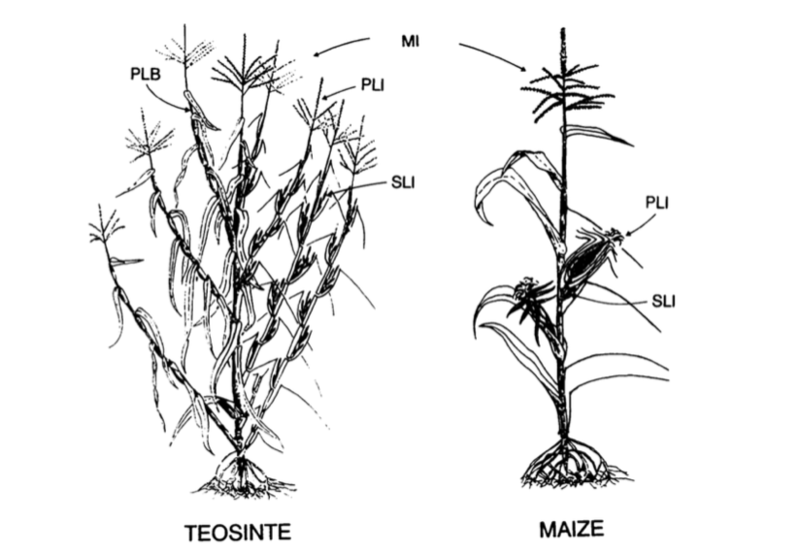 Work from John Doebley's lab has mapped the genetic differences between teosinte and maize. Genetic studies identified the relatively few gene loci account for around 90% of the difference in form between teosinte and maize. These cause differences in traits like vegetative branching, morphology and floral architecture. Many, if not most, of the important traits introduced during domestication are the result of coordinated changes in plant growth and form. While there may be simple genetic triggers for these changes, the modified traits are the result of programmed alterations in complex developmental and metabolic pathways. Archeological remains of prehistoric corn varieties. Image: Robert S. Peabody Museum of Archaeology, Phillips Academy, Andover, Massachusetts. Looking at historic and new trait development in relatives of the Brassica family - many of the plants shown below might be taken to be different species, however the morphological differences that you can see are due to selective breeding. All of these recognisably different vegetables are derived from the same ancestor species, Brassica oleracea or wild mustard. Breeding has led to the enhancement or exaggeration of particular features. For example the appearance of cauliflower is due to over-proliferation of shoot meristems, broccoli has a proliferation of floral buds, cabbage and Brussels sprouts have exaggerated vegetative meristems, and kohlrabi has a swollen stem. Crop breeding experiments have shown that genetic modification in different species can converge on particular useful traits. 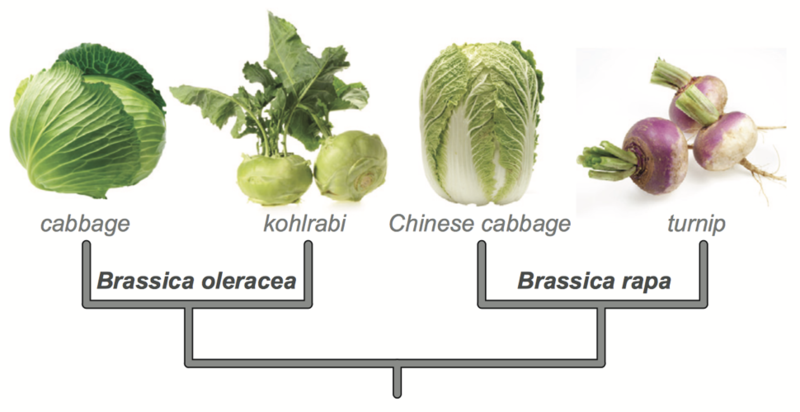 For example: for both Brassica oleracea and Brassica rapa, genetic variants have been selected independently for (i) indeterminate vegetative meristems and proliferation of leaves, and (ii) hyper proliferation of tissues at the base of the stem - to give rise to cabbage/chinese cabbage and kohlrabi/turnip, respectively. These were obtained from random mutations over many generations of conventional plant breeding, but provide an indication of the potential utility of directed gene editing techniques, which can be fast and applied to many new species.